The study explored the impact of using a double bridle and crank noseband on the behaviour of 12 horses that had not worn the equipment before. Over the course of four days, the scientists monitored how each horse responded to wearing the noseband in four different ways, ranging from tight to completely unfastened. The researchers have suggested that nosebands on all horses should be checked using a plastic gadget known as a taper gauge. The FEI have commented that it "respects the research that has gone into developing the taper gauge. 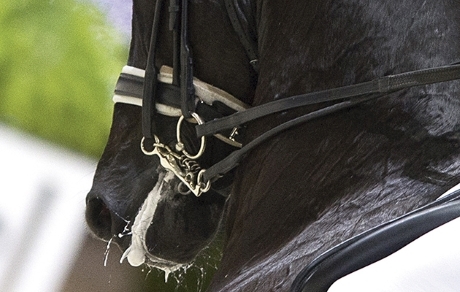 However, at competitions when horses - just like human athletes - can be high-strung, it is felt that a physical check is still the safest and most effective method of ensuring that nosebands are fitted correctly.” A spokesman also commented that “FEI stewards officiating at FEI events check all the saddlery, including nosebands and bits, of every horse.